Background/Aim: The objective of this study was to investigate the relationship between MUC2 immunostaining and clinicopathological characteristics in a subset of colorectal carcinomas (CRCs). Materials and Methods: A total of 128 CRCs, 50 local nodal metastases, and 42 normal colonic mucosae were retrieved from the archives at the Department of Pathology at King Abdulaziz University, Jeddah, Saudi Arabia. Immunohistochemistry was performed using anti-MUC2 antibody. A cut-off of 25% of positive immunostaining was used to define low and high immunostaining. Statistical tests were used to determine the association of MUC2 with clinicopathological characteristics and survival. Results: MUC2 immunostaining was observed in 66.7% in normal colonic mucosa. Low MUC2 immunostaining was higher in primary CRC (P = 0.003) and nodal metastasis (80%) (P < 0.001). There was significant association of low MUC2 immunostaining in CRC with age group below 60 years (P = 0.05) and occurrence of lymphovascular invasion (P = 0.034). Other clinicopathological parameters were not correlated with MUC2 immunostaining. Regression analysis revealed that low MUC2 immunostaining was an independent predictor of lymphovascular invasion (P = 0.041). 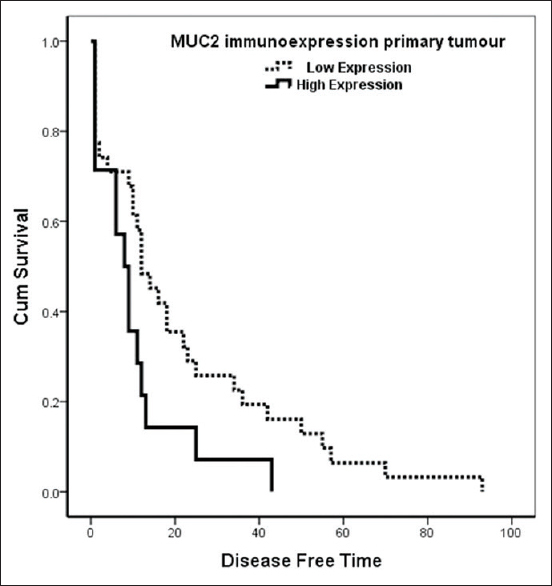 In the Kaplan–Meier survival analysis, there was a significant longer disease-free survival in patients with low MUC2 immunostaining (P = 0.045). However, there was no association between MUC2 immunostaining and overall survival (P = 0.601). Conclusion: MUC2 immunostaining may have distinct clinical significance and provide valuable information and could be considered as an important independent prognostic factor while planning the adjuvant therapy in CRC. In future perspective, characterization of MUC2 immunostaining on a large number of cases and molecular studies may be needed. Colorectal carcinoma (CRC) is the third most common cancer and the fourth most ccommon cause of cancer death globally. It accounts for roughly 1.2 million new cases and 600,000 deaths per year. Incidence is low at age below 50 years but strongly increases with age. Significant international variations in distribution of CRC have been observed. An estimated 92% of colon cancer patients and 84% of rectal carcinoma patients undergo surgical resection as primary modality of treatment. The appropriateness of adjuvant therapy and prediction of outcome for the patient are, to a large extent, based on the pathological assessment of local disease and other tissue-based prognostic factors in the resection specimens. In CRC, the stage of the disease is currently the strongest prognostic parameter and therefore used as basis for therapeutic decisions. However, patients with tumors of same pathological stage may experience substantially different clinical outcomes, especially in intermediate stage. Different patients may thus benefit from different therapeutic and surveillance strategies. A hallmark of CRC is the ability to secrete mucus. Normally, mucus lubricates and protects epithelial surfaces. The composition of mucus varies with the location and their pathophysiological conditions. Normally, mucus is composed of water, inorganic salts, immunoglobulins, protein, and mucins. Mucins are the major secreted glycoproteins of gastrointestinal tract and play a role in normal physiological processes and in the neoplastic progression and metastasis of colon cancer cells. There are two structurally and functionally distinct classes of mucins: membrane associated and secreted glycoproteins. To date, 20 human mucins have been identified. Secreted mucins can be gel-forming or nongel-forming. These mucin products are encoded by various MUC genes. The genes for the gel-forming mucins MUC2 and MUC5AC are found in a cluster on chromosome 11p15.5. The MUC2 gene codes for a typical secretary mucin, which is predominantly found in colorectal goblet cells., With the recent development of molecular markers, it has become possible to characterize the tumors at the molecular level. The need for informative molecular markers that provide prognostic information over and above that given by conventional pathological staging of CRCs has been repeatedly emphasized. In CRC, several mucins have been analyzed, in relation to adenoma–carcinoma sequence, MUC1 and MUC2 being the best characterized. However, data on clinical significance, particularly the potential prognostic value of mucin expression in CRC, are limited and contradictory. The objective of this study was to investigate the relationship between the immunostaining of MUC2 and clinicopathological characteristics in a subset of CRC. The study included paraffin wax blocks of tumors from 128 CRC and corresponding 50 nodal metastases in addition to 42 nonneoplastic normal colonic mucosae. Blocks were retrieved from the archives of the Department of Pathology at King Abdulaziz University, Jeddah, Saudi Arabia. Patients' clinicopathological characteristics are listed in [Table 1]. The study was approved by the Research Committee of the Biomedical Ethics Unit, Faculty of Medicine, King AbdulazizUniversity. Disease-free survival (DFS) and overall survival (OS) were calculated as the time from diagnosis to the appearance of recurrent disease (or date last seen disease-free), and time from diagnosis to death or to the date last seen alive, respectively. Archival paraffin-embedded CRC samples were used to build up tissue microarray blocks for immunohistochemical staining. Areas of interest were chosen from the original blocks. Necrotic and autolytic areas and areas containing predominantly the stromal tissue were avoided. These representative areas were marked on hematoxylin and eosin-stained slides from selected paraffin blocks, and two cylinders of tissue each 1.5 mm in diameter were punched with an automated TMA instrument (Master 3D Histech). TMA paraffin blocks were cut at 4 μm and mounted on positive-charged slides (Leica Microsystems Plus Slides). Sections were deparaffinized in xylene and rehydrated in an automated immunostainer (BenchMark XT, Ventana® Medical Systems Inc., Tucson, AZ, USA). Pretreatment was done using CC1 (prediluted cell conditioning solution) for 60 min. Antihuman mouse anti-MUC2 polyclonal antibody (Cell Marque; MRQ-18) was incubated at 37°C for 20 min. Ventana® I-view DAB detection kit was used according to kit manufacturer instructions. Subsequently, slides were washed, counterstained with Mayer's hematoxylin, and mounted. Negative control and positive control slides were included. Immunoreactivity was independently evaluated by two investigators (WG and SS), and discrepancies were resolved by discussion. The staining percentage was expressed as five categories; (0) no staining, (1) when <10% of epithelial cells were positive, (2) when 5–<25% of epithelial cells were positive, and (3) when labeling in 25–50% of epithelial cells, and (4) when 50% or more of epithelial cells are positive. For statistical purpose, scores 0, 1, and 2 were considered as low immunostaining and scores 3, 4, and 5 were considered high immunostaining. 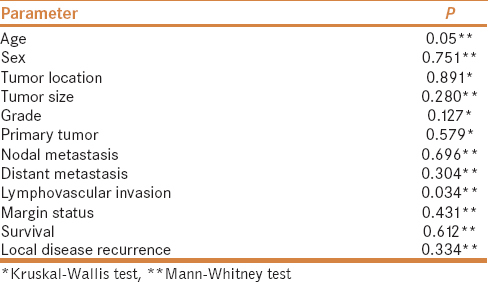 Differences between two groups of patients on one variable were tested by using Mann–Whitney test. To test association procedure in three groups of patients, the Kruskal–Wallis test was used. Nonparametric Chi-square was used to test variance along one variable. Binary logistic regression analysis was used to predict prognostic parameters in relation immunostaining of MUC2. Estimated odds ratio [exponential (B)], 95% confidence interval (CI) for exp (B), and significance denoted for each analysis. The Kaplan–Meier procedure was used to calculate the survival probabilities and the log-rank test was used to compare the difference between survivals. Statistical analyses were performed using SPSS ® Release 16.0 (Chicago, IL, USA). Statistical significance was determined at P value of ≤0.05 and was two-sided. MUC2 immunostaining was detected perinuclear cytoplasmic in normal colonic epithelial cells and diffuse granular cytoplasmic in malignant cells. High MUC2 immunostaining was demonstrated more in normal colonic mucosa cases (66.7%) than in low immunostaining (33.3%) (P = 0.031). In primary tumors, low MUC2 immunostaining (63.3%) was higher than high MUC2 immunostaining (36.7%) (P = 0.003). In nodal metastasis, low MUC2 immunostaining (80%) was higher than high MUC2 immunostaining (20%) (P < 0.001). Results are shown in [Table 2]. Representative images are shown in [Figure 1]a [Figure 1]b [Figure 1]c [Figure 1]d [Figure 1]e [Figure 1]f.
Low MUC2 immunostaining in CRC is associated with age group below 60 years (P = 0.05) and occurrence of lymphovascular invasion (P = 0.034). Other clinicopathological parameters are not correlated with MUC2 immunostaining. Results are shown in [Table 3]. Regression analysis revealed that low MUC2 is an independent predictor of occurrence of lymphovascular invasion [exp(B) = 3.294, P = 0.041, 95% CI for exp (B) = 1.047–10.365]. In the Kaplan–Meier survival analysis, there was a significant longer DFS in patients with low MUC2 immunostaining [P = 0.045, log-rank (Mantel–Cox) = 4.012]. However, there was no association between MUC2 immunostaining and OS [P = 0.601, log-rank (Mantel–Cox) = 0.273] [Figure 2] and [Figure 3]. MUC2 represents the prominent gel-forming colorectal mucin and is usually expressed by goblet cells.,, It is enriched in mucinous adenocarcinoma and can be lost during the carcinogenic process in conventional adenocarcinoma. Several studies have evaluated the relations between MUC2 protein immunohistochemical expression and clinicopathological characters in patients with CRC. However, the results of various studies are conflicting or inconclusive. It is unknown whether differences in the investigation have been mostly due to their limited sample size or genuine heterogeneity. According to a meta-analysis report, there have not been sufficient studies to assess the association of MUC2 with the prognosis in CRC. We found a significant association between low MUC2 immunostaining and occurrence of lymphovascular invasion (P = 0.034) which is in agreement with a previous study. Importantly, we found that low MUC2 immunostaining was the independent predictor of lymphovascular invasion. The invasion of tumor cells into lymph or blood vessels represents a crucial step in the metastatic process. In CRC, vascular invasion has been associated with the occurrence of lymph node metastases and distant metastases and proved to be a significant prognostic variable in patients with CRC., In CRC, low MUC2 requires greater attention to look for lymphovascular invasion and metastatic lesion. The data about the prognostic impact of MUC2 are conflicting. There have been insufficient studies to assess association of MUC2 with prognosis in CRC. In the current study, there is a significant longer DFS in patients with low MUC2 immunostaining in Kaplan–Meier analysis (P = 0.045); however, there was no association between MUC2 immunostaining and OS (P = 0.601). 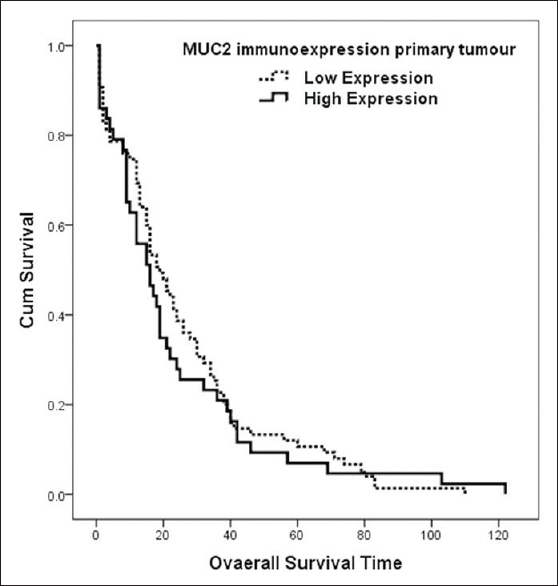 Previous studies have shown that MUC2 is not significantly associated with prognosis., On the contrary, low MUC2 is associated with worse survival.,, The conflicting results may originate from the use of different number of patients, technical issues in immunohistochemistry, and the use of different cutoff points for assessing immunostaining. However, the association of low MUC2 immunostaining with better OS may be related to low mucin secretion in these tumors. This may raise speculation whether mucin facilitates metastasis and denotes prognosis. MUC2 immunostaining may have distinct clinical significance. MUC2 immunostaining was decreased in CRC and nodal metastasis. Low MUC2 immunostaining showed significant association with age below 60 years, lymphovascular invasion, and longer DFS. Low MUC2 serves as an independent predictor of lymphovascular invasion. MUC2 immunostaining in CRC cases may provide valuable information and could be considered an important independent prognostic factor while considering the adjuvant therapy in CRC. In future perspective, characterization of MUC2 immunostaining on a large number of tumors along with molecular studies may be needed. This project was funded by the National Plan for Science, Technology and Innovation (MAARIFAH) King Abdulaziz City for Science and Technology - the Kingdom of Saudi Arabia – award number (11-BIO1524-03). Brenner H, Kloor M, Pox CP. Colorectal cancer. Lancet 2014;383:1490-502. Center MM, Jemal A, Smith RA, Ward E. Worldwide variations in colorectal cancer. CA Cancer J Clin 2009;59:366-78. Compton CC. 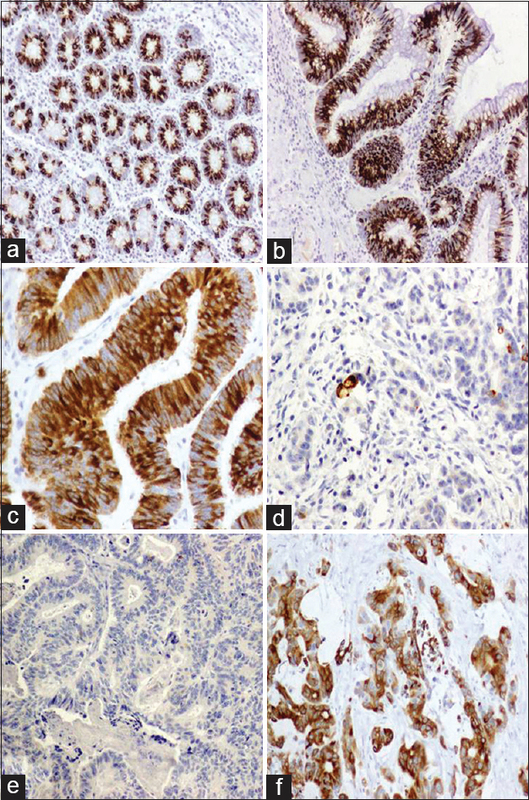 Colorectal carcinoma: Diagnostic, prognostic, and molecular features. Mod Pathol 2003;16:376-88. Betge J, Schneider NI, Harbaum L, Pollheimer MJ, Lindtner RA, Kornprat P, et al. MUC1, MUC2, MUC5AC, and MUC6 in colorectal cancer: Expression profiles and clinical significance. Virchows Arch 2016;469:255-65. Kesari MV, Gaopande VL, Joshi AR, Babanagare SV, Gogate BP, Khadilkar AV, et al. Immunohistochemical study of MUC1, MUC2 and MUC5AC in colorectal carcinoma and review of literature. Indian J Gastroenterol 2015;34:63-7. Byrd JC, Bresalier RS. Mucins and mucin binding proteins in colorectal cancer. Cancer Metastasis Rev 2004;23:77-99. Imai Y, Yamagishi H, Fukuda K, Ono Y, Inoue T, Ueda Y, et al. Differential mucin phenotypes and their significance in a variation of colorectal carcinoma. World J Gastroenterol 2013;19:3957-68. Jass JR. Mucin core proteins as differentiation markers in the gastrointestinal tract. Histopathology 2000;37:561-4. Al-Maghrabi J, Gomaa W, Buhmeida A, Qari Y, Al-Qahtani M, Al-Ahwal M, et al. Prognostic significance of VEGFR1/Flt-1 immunoexpression in colorectal carcinoma. Tumour Biol 2014;35:9045-51. Molaei M, Mansoori BK, Mashayekhi R, Vahedi M, Pourhoseingholi MA, Fatemi SR, et al. Mucins in neoplastic spectrum of colorectal polyps: Can they provide predictions? BMC Cancer 2010;10:537. Li L, Huang PL, Yu XJ, Bu XD. Clinicopathological significance of mucin 2 immuno-histochemical expression in colorectal cancer: A Meta-analysis. Chin J Cancer Res 2012;24:190-5. Perçinel S, Savaş B, Ensari A, Kuzu I, Kuzu MA, Bektaş M, et al. Mucins in the colorectal neoplastic spectrum with reference to conventional and serrated adenomas. Turk J Gastroenterol 2007;18:230-8. Pelaseyed T, Bergström JH, Gustafsson JK, Ermund A, Birchenough GM, Schütte A, et al. The mucus and mucins of the goblet cells and enterocytes provide the first defense line of the gastrointestinal tract and interact with the immune system. Immunol Rev 2014;260:8-20. Kim YS, Ho SB. Intestinal goblet cells and mucins in health and disease: Recent insights and progress. Curr Gastroenterol Rep 2010;12:319-30. Ishizu H, Kumagai J, Eishi Y, Takizawa T, Koike M. Mucin core protein expression by colorectal mucinous carcinomas with or without mucus hyperplasia. J Gastroenterol 2004;39:125-32. Huang WB, Shi LH, Zhu XQ, Xu GX, Qi Q. Expression of mucin MUC1 and MUC2 in colorectal carcinoma and their clinical significance. Ai Zheng 2002;21:1231-4. Matsuda K, Masaki T, Watanabe T, Kitayama J, Nagawa H, Muto T, et al. Clinical significance of MUC1 and MUC2 mucin and p53 protein expression in colorectal carcinoma. Jpn J Clin Oncol 2000;30:89-94. Ajioka Y, Allison LJ, Jass JR. Significance of MUC1 and MUC2 mucin expression in colorectal cancer. J Clin Pathol 1996;49:560-4. Al-Khayal K, Abdulla M, Al-Obaid O, Zubaidi A, Vaali-Mohammed MA, Alsheikh A, et al. Differential expression of mucins in middle eastern patients with colorectal cancer. Oncol Lett 2016;12:393-400. Hadi NI, Shakoor KA, Kafil N. Immunohistochemical study of mucins in colorectal carcinoma: Could it be a guide for biological behavior? J Surg Pak (International) 2009;14:103-7. Elzagheid A, Emaetig F, Buhmeida A, Laato M, El-Faitori O, Syrjänen K, et al. Loss of MUC2 expression predicts disease recurrence and poor outcome in colorectal carcinoma. Tumour Biol 2013;34:621-8. Bayar S, Saxena R, Emir B, Salem RR. Venous invasion may predict lymph node metastasis in early rectal cancer. Eur J Surg Oncol 2002;28:413-7. Betge J, Pollheimer MJ, Lindtner RA, Kornprat P, Schlemmer A, Rehak P, et al. Intramural and extramural vascular invasion in colorectal cancer: Prognostic significance and quality of pathology reporting. Cancer 2012;118:628-38. Baldus SE, Mönig SP, Hanisch FG, Zirbes TK, Flucke U, Oelert S, et al. Comparative evaluation of the prognostic value of MUC1, MUC2, sialyl-Lewis(a) and sialyl-Lewis(x) antigens in colorectal adenocarcinoma. Histopathology 2002;40:440-9. Manne U, Weiss HL, Grizzle WE. Racial differences in the prognostic usefulness of MUC1 and MUC2 in colorectal adenocarcinomas. Clin Cancer Res 2000;6:4017-25. Kang H, Min BS, Lee KY, Kim NK, Kim SN, Choi J, et al. Loss of E-cadherin and MUC2 expressions correlated with poor survival in patients with stages II and III colorectal carcinoma. Ann Surg Oncol 2011;18:711-9. Wang H, Jin S, Lu H, Mi S, Shao W, Zuo X, et al. Expression of survivin, MUC2 and MUC5 in colorectal cancer and their association with clinicopathological characteristics. Oncol Lett 2017;14:1011-6.